Whether you call it karma, fate, God, coincidence or perfect timing, it was present for Kainan Rejtharek one winter day. His story is a testament to this, and REACH is grateful to be a part of the story. Before hanging up, the doctor explained why he had been reluctant to start the emergency open-heart surgery before their arrival: he wanted to make sure the Rejthareks have a chance to say goodbye to their 17-year old son. Kainan Rejtharek, an experienced dirt bike rider in a family of experienced dirt bike riders, had taken a weekend trip to Ocotillo Wells, a popular Southern California destination among off-road vehicle enthusiasts. Such trips were usually a family affair, but this time Kainan went with friends. During that morning’s ride, the boys had an opportunity to climb a big hill. Kainan successfully made it to the top. The other two boys decided to go on a little ride of their own. They had no idea what happened while they were exploring. It never crossed their minds that Kainan might ride off a cliff. “He thought it was a flat,” his mom explains, “but it was a 60 foot drop.” At the end of that five and a half story fall, Kainan landed on his head—and the dirt bike landed on Kainan. 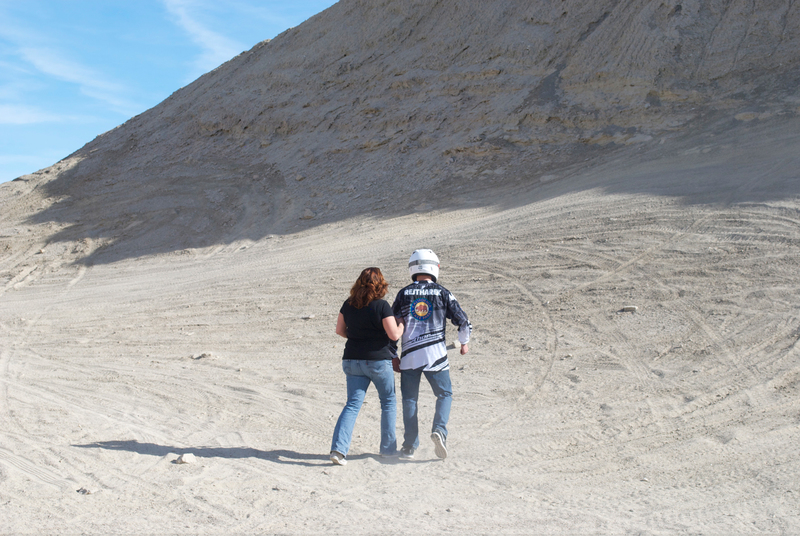 Kainan and his mother Jill begin the climb up the cliff that Kainan accidentally drove off. Cindy Olsen and her family were also at Ocotillo for the weekend. That day, something caught Cindy’s eye. At the top of a hill some distance away, she saw “the most perfect, beautiful yellow bike, with a rider wearing yellow gear”. She thought he looked like someone worth watching, so she did…just in time to witness the accident. The Olsens set out across the desert of Ocotillo in search of assistance for the rider in yellow. The first person they came across was an off-duty medic. He joined them. Next, they crossed paths with a man who just happened to be a coordinates specialist. He called in the location. Further along, they saw an EMT vehicle. Turns out paramedics were working on someone with a broken femur, and a helicopter was already on its way. That helicopter was coming from the REACH base in Thermal, and it was reassigned to Kainan when Cindy reported what she had seen. Although he was alone on that hill, and despite the fact that the Olsens were without phones or GPS, Kainan was on his way to help within 25 minutes of the accident. Knowing that the REACH crew (Pilot Mike Tanner, Flight Paramedic Greg Lattimore and Flight Nurse Theresa Terry) would arrive soon and that time was of the essence, on-site caregivers carefully moved Kainan onto a backboard. 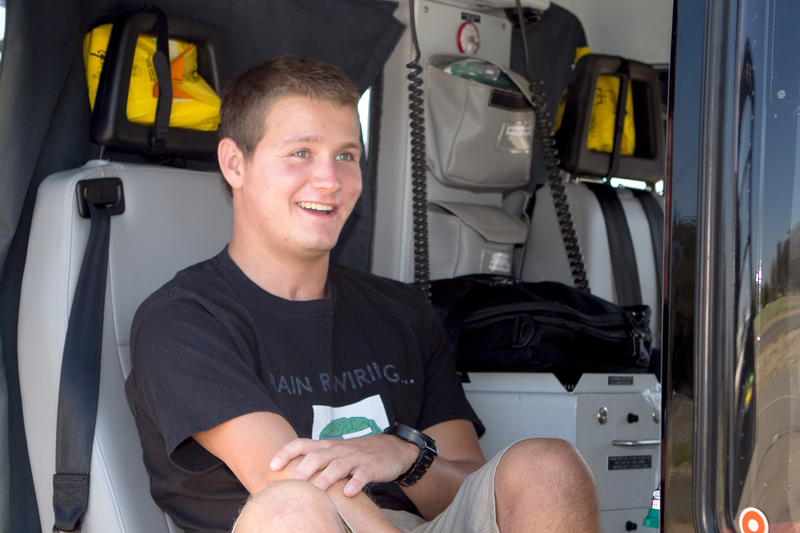 Kainan was flown aboard REACH's Bell 407 helicopter to Desert Regional Medical Center. Kainan was completely unresponsive, but when Greg and Theresa hooked him up to a monitor, they found a blood pressure and a pulse. They quickly loaded up and flew to Desert Regional Medical Center, an acute care hospital in Palm Springs and the Coachella Valley’s only designated trauma center. “We were able to maintain his blood pressure all the way there,” Theresa says. 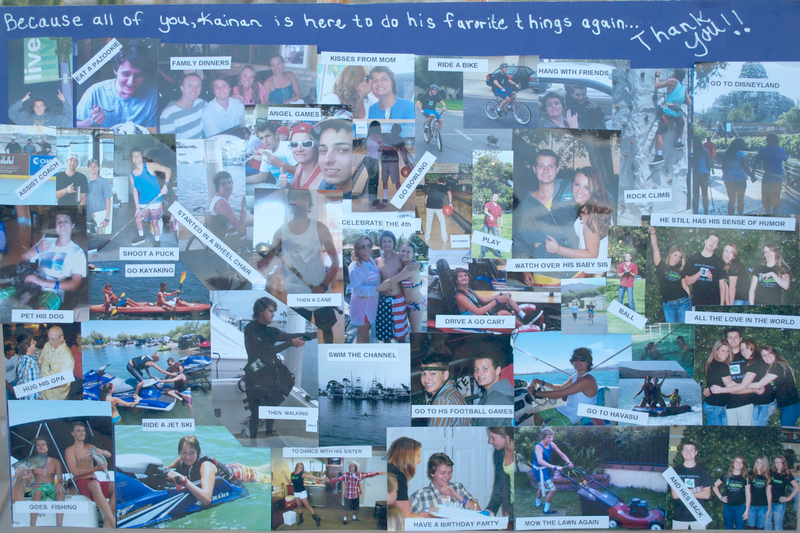 “He was lucky.” This rings especially true in retrospect. A lot of Kainan’s injuries were obvious. His torso was smashed and twisted. He had a broken femur and a dislocated elbow. Greg says, “He was pretty badly broken. He was kind of slowly slipping away from the moment we got him. I remember receiving his helmet. The face guard was completely shattered.” Theresa adds, “We knew that he probably had a brain injury.” But it’s what Greg and Theresa didn’t know that makes Kainan’s story all the more miraculous; they didn’t know that his aorta had been severed. Kainan was in a coma for seven weeks. Jill and Dan Rejtharek made it to the trauma center. 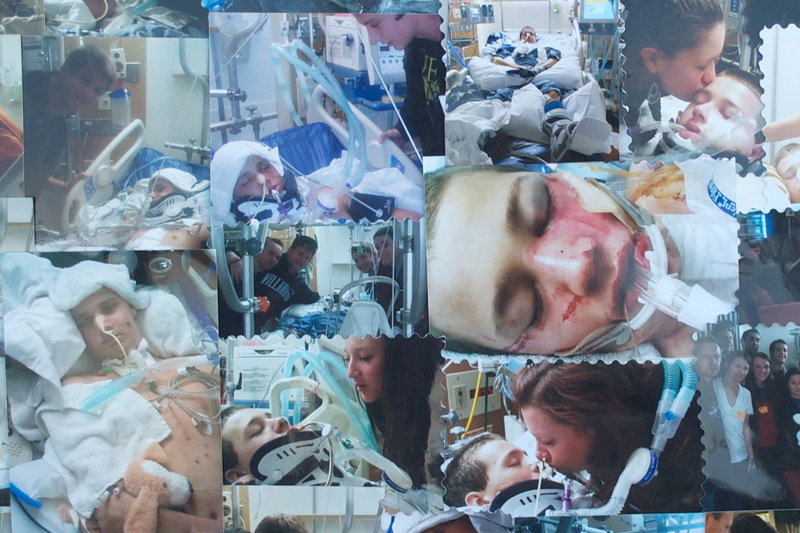 Their son’s emergency open heart surgery, which started at noon, took 11 hours. Earlier, he had been scheduled for emergency brain surgery at midnight, but that was canceled when doctors determined he had a Grade 3 brain injury. (The Glasgow Coma Scale is used to grade traumatic brain injury patients on a scale of 3 to 15. 13 or higher is considered minor; 8-12 is interpreted as moderate; anything below 8 indicates a severe brain injury.) Although Kainan’s many serious injuries dictated a range of surgical procedures, only his aorta was repaired that day. Everything else was put on hold while doctors waited to see if Kainan would make it through the night. but REACH truly does go ‘above and beyond’. One very memorable day, Kainan’s hands indicated another leap of progress—they were able to squeeze. “We got him a little football,” his mother says, “and he started playing with it.” And then came the day he could say “Mom” again. And the day he could successfully sit on the edge of the bed. And use a wheelchair, then a walker, then a cane, and then…walk—hands free. In a true testament to the power of love, family and friends, Kainan is now talking, walking, and even riding a motorcycle again. Mom Jill is happy to report, "He does everything...just at a slower pace." Kainan appreciates everything now--especially the opportunity to fly in a REACH helicopter under much better circumstances than his first flight.